Dinomite was SUPER excited about this week's learning time theme. After all he lives for reptiles! I never thought I'd miss his obsession with dinosaurs or prehistoric creatures or sea monsters, but there's just something about snakes and lizards that make my skin crawl, and of course those are his favorites. We started off the week with a visit to our local pet store. It was very unplanned. We did not know it was family fun day and we did not know that there would be snakes and lizards and tortoises. That is until I almost tripped over the tortoise. I didn't see it crawling across the floor. There are no words to describe how elated Dinomite was to have such a hands on experience with these creatures. Princess surprised us by also being interested in them. Bulldozer, found a juggler in the store and that's where he stayed. He really has no interest in these creatures at all. Farm animals are his thing. We took lots of pictures. I'll share those that don't show the faces of the kiddos. Dinomite touching the python, which he later held all by himself. Princess touching the python, which she later held all by herself! Dinomite touching the boa, which he later held, wrapped around his neck and arm with assistance. The iguana was a little restless so we just looked at him. Dinomite touching the blue tongued skink. It was shedding it's scales. A king snake, resting in his warm cozy cage. An alligator lizard. No one touched this one. A bearded dragon. Dinomite did touch him! We don't have our Montessori blue and red letters of any kind yet, so I made due with our foam letters from The Dollar Store as a hands on component to the ending sound cards I found. Bulldozer LOVED this activity and so did Princess. Identify missing letter on cards and then spell out word using letters. Source: The cards used in this activity came from Montessori Print Shop. Dinomite's reading is coming along well, however he tends to get confused when he sees the letter "s" at the end of a word he knows. To teach him what this letter means and how to pronounce the letter, I created this activity for him. 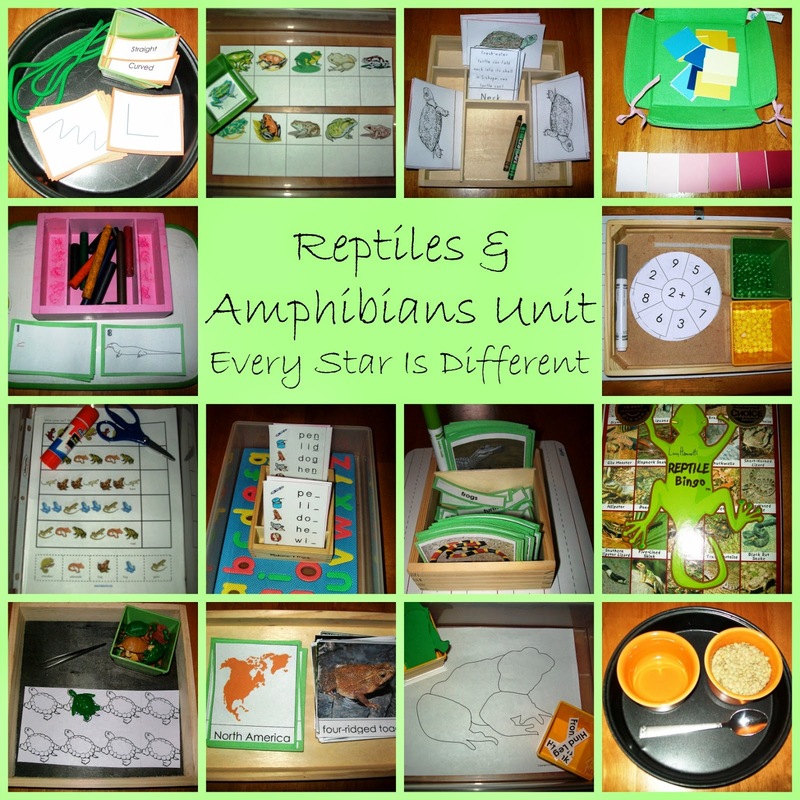 I made cards with pictures of singles and multiples reptiles and amphibians. The cards were labeled with the names of each animal. I printed out two copies of the cards and separated the labels and pictures of one set. Then I added our writing board. 1. Match up cards with labels to separate pictures and labels. One could choose to use only singular animal names or plural animal names. For older kiddos one could use both. 2. Write the names of singular and then plural animals on writing board. 3. Match up singular animals with plural animals. Once more, we worked on patterns this week. All three kiddos are pretty proficient at it and their scissor skills have improved immensely. This was the one activity no one chose this week, so I'm taking the cue that they've mastered patterns and are ready for more challenging material. Source: This print out came from kidsparz.com. Source: This FREE match up game came from Montessori Print Shop. Dinomite has been working on his addition facts and doing quite well. Bulldozer and Princess have shown interest in trying and at times attempt on their own, so I figured it was time to have some addition activities on our shelves. I don't have the beads yet, so I had to invent my own activity. You'll notice I use the addition print outs, 1 pipe cleaner, two different colored beads, an erasable marker and a writing board. The kids choose an addition wheel and place one green bead on the number in the middle. They then select a number on the outside of the wheel and place a yellow bead on it. To help encourage the kids to read and write addition problems, either the kiddo or adult will write out the problem on the white board. The kiddos then string the number of corresponding beads in each color onto the pipe cleaner to find their answer. An example-Dinomite puts the green bead on the 2+ center circle. He then puts the yellow bead on the 8. We write 2+8= on the white board. He then strings 2 green beads onto the pipe cleaner followed by 8 yellow beads to find his answer. After counting the beads, he write the correct answer on the white board. Source: The print out used in this activity came from Montessori for Everyone. Option: Put frog puzzle pieces together and place labels in the correct spot. Source: I found this puzzle at Montessori N' Such. I know the Montessori way seems to be making books with this type of information, but with the special needs of the kids right now, it's a very difficult process, so we just use separate cards. The kids were introduced to the different parts of the turtle and descriptions of each part. I had already colored a set of cards with body parts so they would know what parts were which. 1. Match up description cards with body cards. 2. Color own set of body cards and write correct parts on each card (if able). Source: I found these cards at Montessori Materials. Dinomite's grandparents gave him this game for Christmas this past year, knowing of his love for reptiles. The kids didn't play the game together, but individually so they can learn the process of playing BINGO, how they win the game etc. It is my hope in a year or so, they'll all be ready to play together. For now the process is what we're working on, along with learning to identify and match reptiles. This is our final week of animal/continent match up. I must say, as advanced as I thought this activity might be for Bulldozer and Princess, I was surprised. Bulldozer chose this activity every day. He is now identifying his continents about 75% of the time. It just goes to show how smart he is if material is presented in the right way. I found these animal and continent print outs at Walk Beside Me. We did a unit on the instruments in an orchestra a while back, so I figured I'd bring out the instruments again and see what the kids remembered. I made cards of each of the instruments with labels, cards of each section of instruments, labels for each section of instruments, and then printed another set of instruments and separate labels for a match up. Since our drawing stations have been so successful I decided to add one to this week's activities: How to Draw a Komodo Dragon. Again, it was a hit. Both Dinomite and Princess love it. I love how the cards are numbered and the kids can put them in order, practicing their numbers, while they're working on following directions and prewriting skills. They love to color their animals too. Source: This activity came from How to Draw Animals. I decided to review our primary colors and have the kids practice putting colors in order from lightest to darkest and darkest to lightest. Dinomite found the activity doable, but Princess really struggled with it. Bulldozer did not attempt. It will definitely go back on the shelves soon for more practice. I used paint color samples for our cards. When I found this activity as I was looking for a few more things to fill our shelves, I loved it. Then I realized how easy to would be to make it hands on for the kids. It definitely became a winner! With that said, the kids really struggled to make the lines using the lace I provided. 1. Match up straight and curved lines with their labels. 2. Create the straight and curved lines using the string provided. I found these print outs at Montessori for Everyone. I found this idea to be super cute and couldn't resist using it when I saw it. Each of the kiddos practiced almost everyday, as at first it was a very difficult activity for them, especially when we showed and explained they could only use one hand with the tweezers. Option: Correctly place turtles in spots provided using tweezers. Sources: The printout for this activity came from PreKinders. The idea for this activity came from The Adventures of Bear. There are many activities out there like this, however I chose to use our regular eating spoon and lentils for the activity. Option: Transfer lentils from one bowl to the other without spilling, using the spoon provided. Goodbye reptiles and amphibians until next year! What a great day it looks like you had! I would love to homeschool my own kids. Bless you for all you do! Thank you so much for the kind words on my blog today. We are making a difference!! Kudos to you---you are doing amazing work with your family!! How neat to see so many live animals!